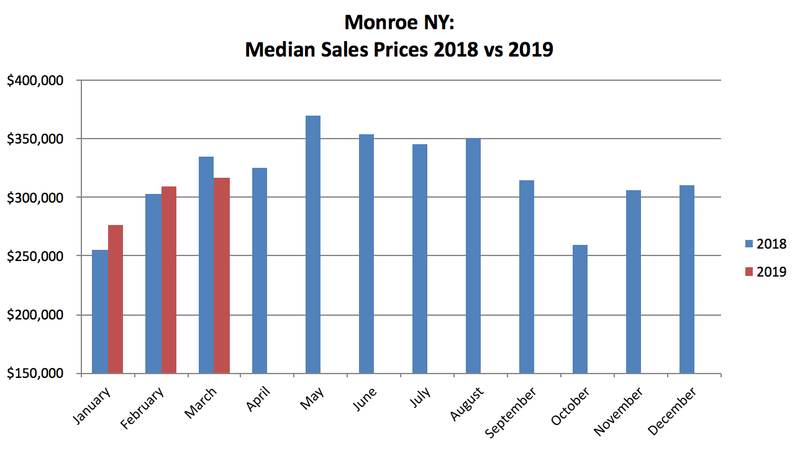 The Monroe, NY real estate results are available for March 2019. The number of monthly sales, available inventory, and sales prices all increased. Following is an overview of the March 2019 Monroe NY results. In the month of March 2019, there were 16 single family home sales, which was a slight increase over February (14%). There are 37 homes currently under contract with more than half going under contract prior to March. Those sales results should start showing up in April. In terms of inventory, at the end of February 2019 there were 75 homes on the market while at the end of March there were 93, an increase of 24%. At this time last year, there were 82 homes on the market, so the Spring market seems to be starting a little earlier in 2019. Also of interest, the current number of active listings represents about four and a half months of inventory. Last month Monroe had about four months of inventory available. That means that while the market is still a seller’s market, it is on the way to being balanced as it was for most of 2018. The median sales price for March 2019 was $316,500, a 2% increase over February 2019. In this area, any months with median prices over $300K indicate a healthy market. To get an idea of the types of homes that are selling, the lowest price home sold in March was a two bedroom, one bath “arts & crafts” style home with 780 square feet of living space. While small in size, the home overlooked Walton Lake, and had outdoor patio/deck/windows on both levels for enjoying the lake views. The listing indicated this home needed TLC. It was listed at $112K and sold for $125K. The most expensive home that sold in March was a four bedroom, two and a half bath Colonial style home with 2,508 square feet of living space. This home had hardwood flooring, custom kitchen cabinets and Quartz counters, a walk-up attic and walk-out basement, deck, yard and more. This home was listed at $455K and sold at $435K. It is a great time to sell. The Spring market is heating up and competition is increasing. If you want to get ahead of the curve, now is the time to get your home on the market! If you are a buyer, it’s important to be ready to make an offer as soon as you find “the” house. The best way to ensure you’re ready is to talk to a real estate professional. I’m happy to help! Call me on 914-419-0270 or email me at kat@thehousekat.com.